Wide print area : 420 mm x 576 mm ! Discover Mutoh’s compact & robustly built ValueJet 405GT, our first ever direct-to-garment printer, featuring four piezo drop-on-demand print heads, latest generation electronics and dedicated high quality water based pigmented textile inks, ideal for customized one-offs and short run production of direct-to-garment applications. In line with our core philosophy to deliver products with technology proven to be faster, more reliable, more cost effective and more efficient, we incorporated our pioneering print automation technology into the VJ-405GT inkjet printer to bring you the best equipment for your application. 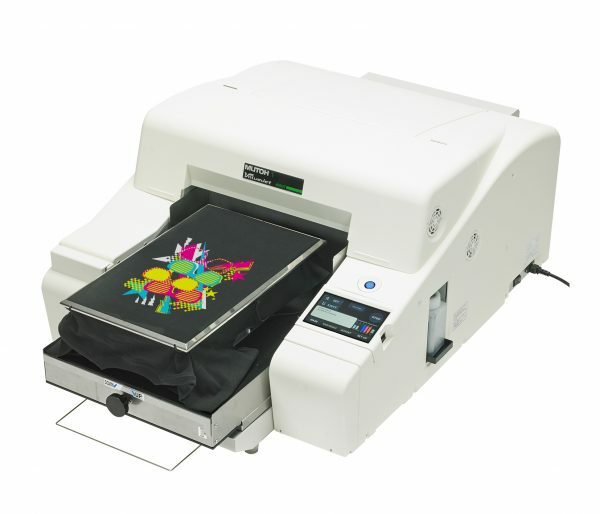 Accommodating different sizes of easily interchangeable print platens (S, M, L) and an easy-to-use LCD touch screen, the VJ-405GT is convenient for established as well as starting direct-to-garment businesses. Mutoh’s VJ-405GT direct-to-garment printer has CMYK + White inks on board – with a dedicated ink circulation system for the white – for the digital production of dark coloured and light coloured garments. With a printable area of 420 x 576 mm and print resolutions up to 1200 x 1200 dpi the ValueJet 405GT offers you high print quality outputs. Mutoh’s Oeko-Tex® compliant water-based pigmented textile inks will allow you to produce vibrant colours with excellent white ink density on a variety of garments. The standard printer includes an installer & driver software for Windows, as well as a Mutoh proprietary “layout & print” software tool to facilitate quick & easy operation.